Sooo I've finally added LOTS of new holiday card designs to my Zazzle shop! I'm in love with these designs, and I hope everyone loves them as much as I do! Until tomorrow, you can get 50% off of cards plus $5 off postage with coupon code SENDZAZCHEER so definitely take advantage of that! Well, it looks like I've found my latest design obsession. 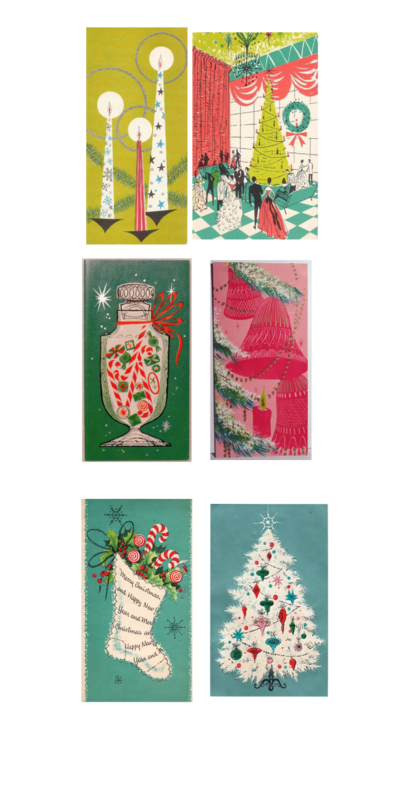 While I'm not a huge fan of mid-century modern furniture, I'm in love with these greeting cards! The colors are so vibrant, quirky, vintage-yet-modern, and just fun! I found these on Pinterest; most had already been sold on Ebay, unfortunately. These cards just reinforce my love of vintage design. You just don't see art like this anymore.